My young daughter brought her fairly new car in for an oil change today. The did brake work that was not required and without her permission. When she confronted them about it they said they couldn't let her take her car out of there without cleaning her brakes because it was too dangerous. Complete BS. Her brakes were fine. I already checked them out. Her oil change ended up costing $500. My wife had an even worse experience with them about 6 months ago. Service manager is useless. Eli sold us our Sonata two years ago and we appreciated his help back then as well his ongoing support. It's great to go into the dealership and be greeted by Eli as well as converse with him (about our next car purchase). We have and will continue to refer family and friends to him. Our visit today was for service for an issue with the engine light. Dyllan explained the problem to us and the car will be ready tomorrow! Excellent help going over options and very knowledgeable. Eli was very helpful and friendly and really built my trust. He worked to make sure I got all the information I needed to feel comfortable with my purchase. I would definitely deal with him again. I felt like I made a new friend. "I had a seamless transition into a new vehicle. " I purchased a new Kona and love it. All my questions were answered and a stressful purchase in ones life become seamless and comfortable. Very knowledgeable, not pushy and patient. "Respected my time and wasn't pushy"
My wife and I had to replace our Toyota after being hit during our last bout of freezing rain. We wanted something reliable but not as big as our kids are now in University. My brother has been a big Hyundai guy and has owned many in his life. He convinced me to go look at the Santa Fe and Tucson. When we went in Iwas still in pain from the accident and using a cane. There was a lovely greeter, Allison, who introduced us to George. When we told George why we were there, and how we came to be there, he immediately invited us into his office to sit down and have a coffee so I could get off my feet. I appreciated this. He asked us questions, narrowing down what we wanted/needed and told us to relax as he went to get a car to show us. When he came to get us he walked slowly beside me patiently, like he had all the time in the world. He had brought us up a white Tucson Preferred. It had all of the things we wanted and was a good size for what we wanted. The only thing we didin't like was that it was white. He assured us we could get one in the red we saw should we like it. And we did like it. I like to negotiate and have to admit I gave George a bit of a hard time, but he smiled through it all and even brought in his manager Jason who verified the offer we made. He explained that he couldn't do what I asked but did make me an offer I think was more than fair. Looking back I never buy anything without thinking about it a day or two first. But I did that day because there wasn't any pressure. I would recommend George and Jason to anyone who wants to purchase a Hyundai. "First time buying a car on my own"
My husband was away hunting when our car was written off by insurance...I needed to find a car quick and knew we wanted to try Hyundai. I went to Myers because they were close and convenient to our home in the Ottawa Valley. I was very nervous to do this on my own but Myers Hyundai made me feel comfortable and safe from the moment I walked in. Great no pressure, no rush sales and answered all my questions completely. Went in looking for a new car and glad I did. I was greeted immediately and not by an aggressive sales rep like I was at another Hyundai location but by a greeter. This helped me relax right away as I am not a fan of the whole car buying experience. From there I was introduced to Peter. He took the time to go over all options with me until I was completely satisfied. At no point did I feel the same was more important than my questions. 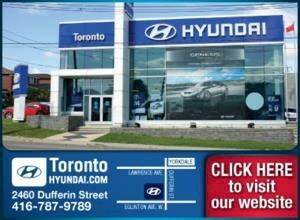 Overall I am extremely happy with my new car and the whole Myers Kanata Hyundai team.